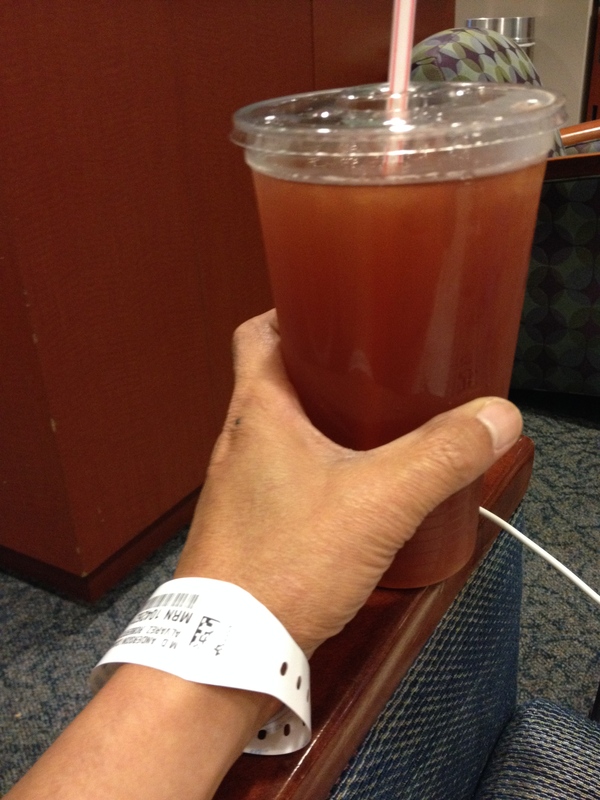 I still hurt from the spleenic embolization I had last Thursday, June 19. Spleenic embolization is a non-invasive procedure that is used to disable part of the spleen, where blood platelets are stored. Think of the spleen as the gas tank for platelets, only mine has grown slightly in size due to long periods of chemo. To objective is to resize my spleen to make it store less platelet and boost the count. Humans can exist without spleen you just have to watch your diet. The conventional approach is open you up for surgery or use embolization technique. The is latter is non-invasive–and better–because the procedure calls for inserting a catheter in an artery in your groin. From there, using a dye to map your arteries they navigate the catheter until they reach the spleen. (Note: This is my second embolization, the first was in 2009 when my cancer mets to my liver. See post, At the starting line with Dr. B, December 22,2009). Upon reaching the spleen, certain arteries that deliver blood to the spleen are blocked thereby effectively disabling that area. The result is a reduction in the effectivity of the spleen to store platelets. Since mine was already enlarged 60%-70% of my spleen capacity was reduced. Being non-invasive does not mean it is not painful afterwards. During the procedure they are awake because they need you to move to certain position to put the catheter in the right place. Don’t worry it is just a blur. The after care is the challenging part. It is deciding how much “care” and recovery you need. The doctors have warned me about pain from the spleen and a referred pain to the left back shoulder for the next two to three weeks. While at the hospital, you are practically drugged to your senses. I was given my favorite “toy” again, a contraption that continuously deliver morphine and as bonus after a prescribed time, you press this red button and more morphine comes out. Whoosh. Watch out morphine rush. Then to help you sleep more drugs and narcotics. The danger is you become lethargic and constipated. Reality. Reality is also traveling back to Chicago from Houston drugged out and in pain. I have flown many many miles for business and in certain conditions, but none has prepared me for the travel back home. I was in distressed. The high narcotic dose makes me vomit and nauseous. Like many travel nowadays in the US, it is full and delayed. It was not our lucky travel day, our flight was delayed then we were put on a late flight in a different airport (HOU airport to IAH airport, which is 35 miles north). My wife took all the burden of travel since I could not even lift anything. I love her. Back at home and after a week, I am slowly recovering. I still take narcotic pain meds like candies but I found the balance of when to take it and not be constipated. Next step is a blood test if my platelet count responded. his is one holiday that I look forward to after Mother’s Day. With all attention towards Mother’s Day, it is time that we Fathers take the stage. Ha! After all we are not only bread winners in a family, we are also keepers of the honey-do list: Honey do this…honey do that! In my household, I rule. Whatever I say goes. If I say I am going to clean the bathroom, nobody opposes. If I say I am gong to wash the dishes, I do not hear a word from the family. I just have a wonderful family. For this year, we celebrated Father’s Day early, June 6. There is a reason for it is that I will be back at MD Anderson Houston, TX on Father’s Day weekend. I need to consult my low platelet problem and undergo an embolization of the spleen (Note: The spleen functions as a blood filter to the body). They noted my slightly enlarged spleen and want to address this problem. I would rather stay home but that is not the case. I am use to this. We celebrated our version of Father’s Day by having a picnic at the lakefront. It turned out good too and I definitely enjoyed. Ethan, my grandson, enjoyed the most because he has room to run and was playing baseball with the family. I am definitely blessed. It is Father’s Day weekend and I am here at the hospital. It is a Saturday. It is quite at the hospital, but there is still plenty of activity on this floor. Cancer does not wait. I am waiting to have my CT scan done. They will be giving me my prep drink soon and I will have to finish that before the scan. I know the routine having done this many times. It is my first time to have a scan here at MD. In my quest for a cure I have been to many places too like: Mayo, Northwestern, and University of Chicago. All of them are different but the patients who go there are the same. It is the look in their eyes that I always notice. These medical facilities make an effort to make things easy for the sick and desperate. I always get a jolt of reality when I sit in waiting rooms for test or consult. It is a totally different world here compared to the outside in the “normal” world. I straddle both worlds and am always in conflict between the world I want and what I was given. I just ran a half-marathon two weeks ago and now I am here at MD Anderson. Two weeks ago I was surrounded by runners aiming for personal records (PR) and now I am with patients just aiming for a chance of more tomorrows. It is what it is. There are fathers here in this waiting room. They are surrounded by their families. I know each of us wish we were not here but we also know why we are here. Knowing that gives me comfort, I am in good company. P.S. Looking forward to seeing my wife tomorrow to complete my Father’s Day.